Sweet potato fries are tricky little birds. I fell in love with these fries when we toured the Southern States of America last year. 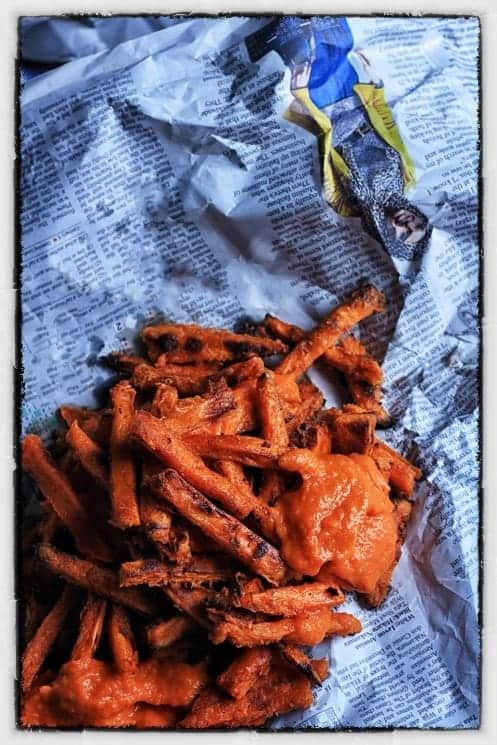 They were as ubiquitous as normal potato fries and I had them in heaped generously into baskets at a blues club with a ginormous burger, then at the Bluebird café, whilst girls and their guitars poured their hearts out to an intimate crowd I scoffed sweet potato fries. I have made and eaten sweet potato fries many times but nothing compared to the fries I ate in America. At home they generally get a bit soft in the oven, refusing to crisp and instead clump together to form more of a sweet potato mess. So it has been my task this week to perfect my favourite chip and get them as uniquely crispy as I know they could be from the States. It seems where I have been going all wrong is that I haven’t been soaking my potatoes in cold water to get rid of all the pesky starch. This does require some planning as you need to soak the cut fries for an hour then dry out completely before baking. It’s worth doing. I was also advised to toss them in cornflour before the oven as well to encourage the moisture out of the chip. I switched this to tapioca flour which sits better with the paleo diet which I like to adhere to occasionally then added some spices of my own and it all worked a treat. I do advise baking them on parchment paper or a silicone sheet as well as these fries love to weld to the baking tray otherwise. The fries came out crunchy, sweet, mustard warm and excellent for dipping into bravas sauce. I made the bravas sauce the day before eating which meant the flavours became more involved. I could eat bravas sauce with anything, don’t feel you have to stick to tradition. It’s lovely over buttered veg and served with any meat. Think of it as Spanish ketchup really. Chop the ends of the sweet potato, peel and chop into thin chips. Submerge the sweet potato chips in a large bowl of cold water and let sit for 1 hour. Drain the chips, pat dry with kitchen towel then place on a plate in the fridge for 1 hour until the chips are completely dry. Mix together the tapioca flour, paprika, mustard, salt and pepper in a plastic food bag. Pour the dry chips into the bag and give a good shake so they are well coated with the seasoning. Place the chips on baking parchment or silicone sheet on a baking tray in a single layer then put into a fan heated oven pre-heated to 220°C. Bake for 25-30 mins until crisped up, carefully turning once halfway through with a metal spatula so you don’t break up the chips. Serve hot with the bravas sauce. To peel and de-seed the tomatoes, mark a cross on the top of each one with a sharp knife and plunge into just boiled water. Leave for a couple of mins until the skin starts to peel away. Lift out with a slotted spoon, peel off the skin, chop each tomato into thirds to remove the seeds. Once the seeds are removed then chop the tomatoes roughly then set aside. In a medium saucepan, heat the olive oil then add the onion and celery. Cook on a medium heat for around 5 mins until they start to soften. Add the chilli and garlic and cook for a couple of mins. Add the tomatoes, the spices, seasoning and the Fino if using. Stir well together, bring to a boil and simmer for around 20-30 mins until the tomatoes have broken down. Pour the tomato sauce into a blender and whizz for a couple of mins, scraping down the sides occasionally to make a thick smooth sauce. Serve hot or cold with the sweet potato fries.